Bracelet with Sapphire Swarovski Crystal. Shown with an optional Sterling Silver Cross charm and Prayer Box Charm. and is armed with strength. 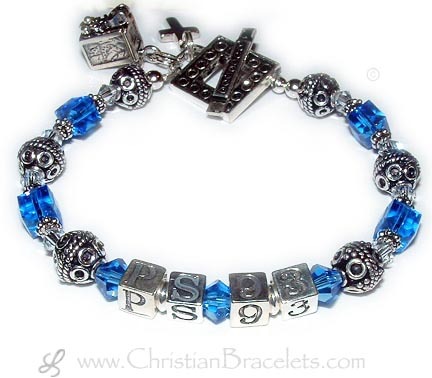 You choose the crystal color and Psalm for this bracelet. It is also shown with an optional sterling silver prayer box charm that opens and you can whisper or write a prayer and stick it inside. It is also shown with an Simple Cross charm which is also optional and can be added during the ordering process. Measure your wrist and add 3/4" to 1" depending on how loose you like your bracelets. SURVIVOR, IN MEMORY, HOPE, COURAGE beads? *Perfect fit & Quality Guarantee... I send all in-stock items out the next business day with just a few exceptions. Items must be paid with credit card (E-check can take up to 10 days to process). During holidays lead time increases. 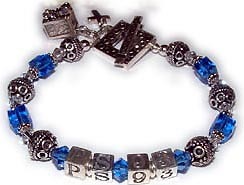 Each piece is individually and custom made by Designs by Leigha(TM) and may not contain the exact beads or clasp shown in the photograph, but probably will :) Most of my bracelet designs may have up to 9 alphabet block letters per string. There are some exceptions to that rule... Additional letters per string; .925 sterling silver $3.00/ea & 14k gold-plated $4.00/ea. Because of the fluctuating silver and gold markets prices are subject to change without notice. Our Swarovski crystal designs are not intended for the creation of children's jewelry nor intended for use by children under the age of thirteen. **Free Shipping is for all orders placed online, going to an US address and over $20.